The Fiddler’s Fun Runs are one of the 3 big events of the year along with the Emma Run and the fall Fiddler’s Run. They are a time for all the Learn-to-Run participants to “strut their stuff” and finish their first race. This year, the weather cleared from rainy skies Saturday to a cool, low-humidity, sunny morning Sunday. Perfect conditions for running! 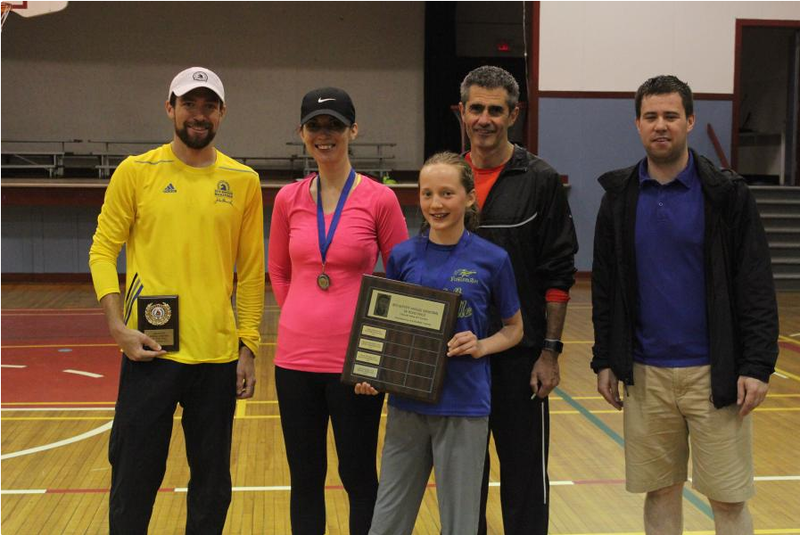 In the 5K, 12-yr-old phenom Gareth MacKinnon held off veteran Dave Bown for a 3-second win. Gareth won despite a problem with the turnaround resulting in running 5.4Km! Julie Curwin suffered the same fate at the turnaround but took the W for the women, finishing 3rd overall not far behind Gareth and Dave. 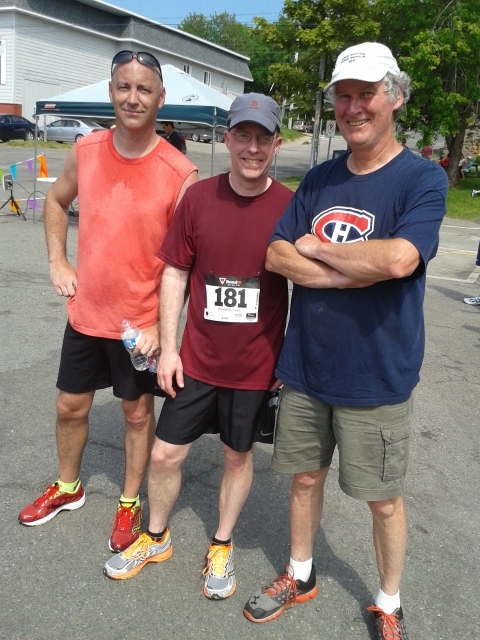 Thanks so much to Nick Burke for putting on both this race, and the James Delorey Memorial Race, every year. Good on ya Nick!! I’ll also be adding a backlog of posts that should have been up a while ago, but better late than never right? 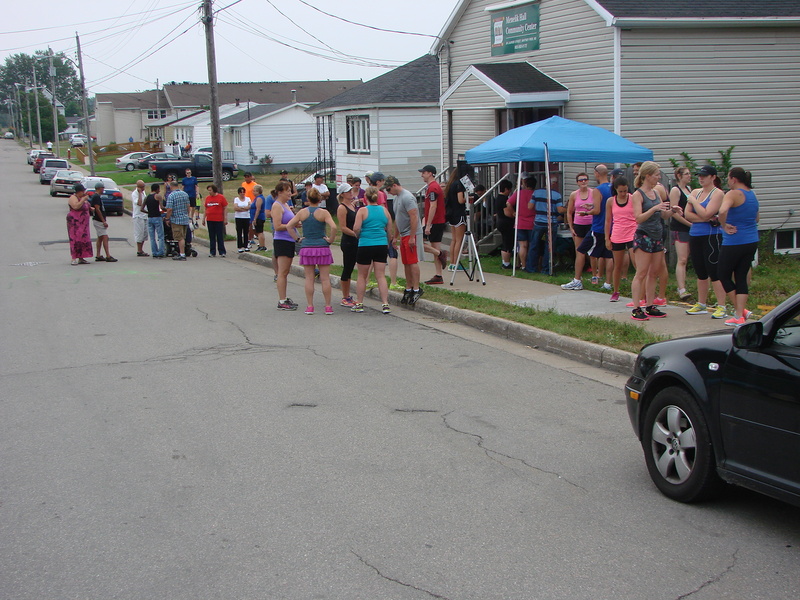 The 5th Annual Ben Buffett Memorial 5k Road Race saw 86 runners brave the rainy conditions on Saturday, June 13th in New Waterford. A donation has been made to the Breton Education Centre scholarship fund in memory of Buffett. 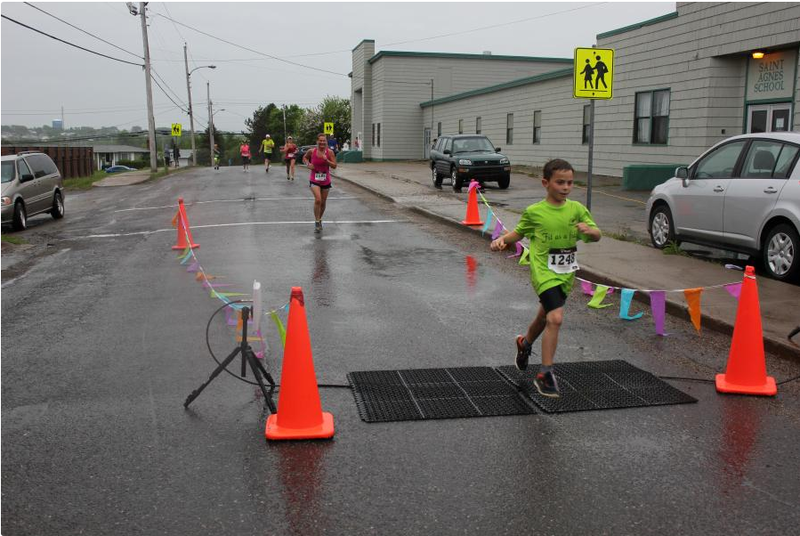 Kelly MacDonald was the first female to cross the finish line in a time of 19:43, followed by twelve year old Baddeck native, Caden MacLeod in a time of 22:28; the third female to cross the finish line was Laura Doucette in a time of 22:35. Top male was Justine Lalanne in 17:09; breaking his top time last year by ten seconds. Dean Abbass was the second male to cross the finish line in a time of 19:18, followed close behind by Max Jennings in a time of 20:01. Local legend, Peter Hanna finished in a time of 25:45; Peter’s first marathon was the Ben Buffett Marathon in 1982. This year’s event saw a presentation by the family of the late Carol Anne McIntyre, who was a member of the New Waterford Learn to Run program and volunteer with the race. 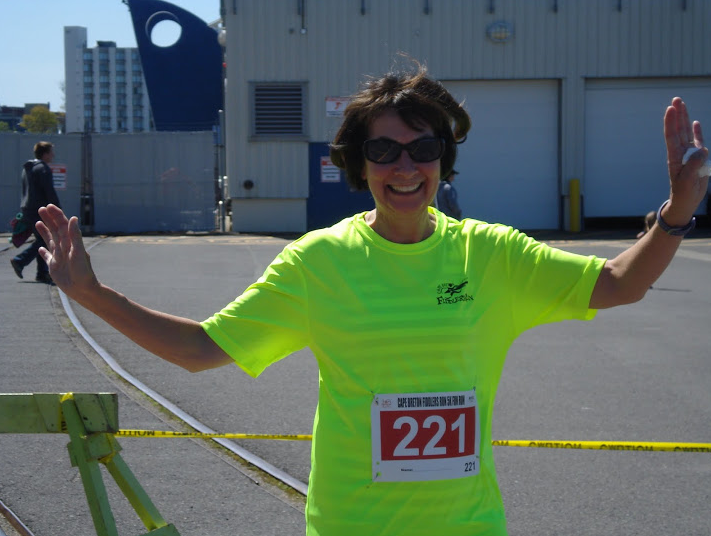 The recipient of the 2015 Carol Anne McIntyre Memorial Inspirational Community Person was Sandra MacDonald, a local running coach and event volunteer who finished the race in a time of 27:47. The 6th Annual Ben Buffett Road race is scheduled for June 4th, 2016; Race Director, Nick Burke is looking to add a 10k route to next year’s event and see over 100 participants. The Scholarship recipient will be announced on BEC’s graduation exercise on June 28th. Remember you can always find race results at cbtrisports.com under “results”, or if it was timed by Jeris Abbass, at limitlessracetiming.com as well. Jonathan Skeete did a lot for his community in a short lifetime. Thanks to those who have kept this run going to keep his memory alive. And thanks to Charlie Sheppard for the photos and the brief report. 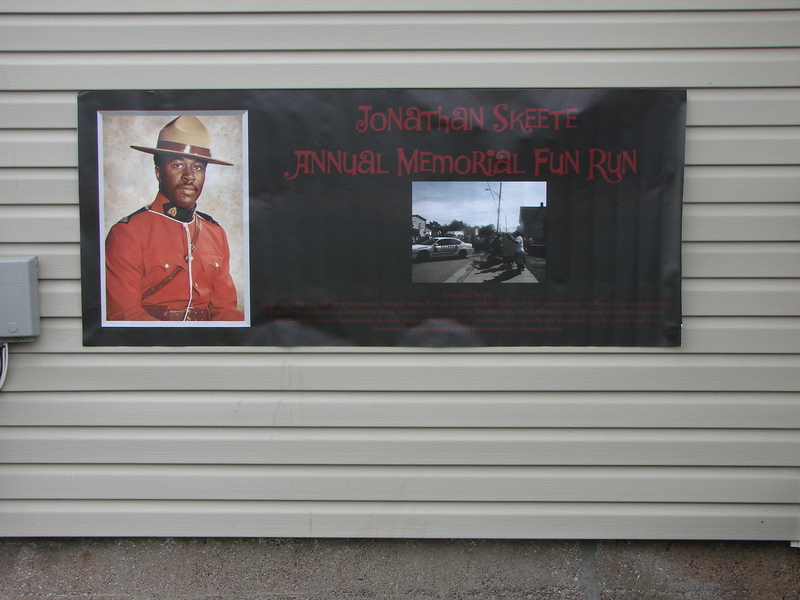 The Jonathan Skeete Memorial Fun Run was a success with over 85 runners and walkers. Here are some photos. Again, thanks to the runners and walkers who showed up and made this a fun event. Special thanks to Bernadette and Stephen who took care of the times for all who participated and thanks to Kathy Sparling for pitching in. Cape Breton has 2 new Ironmen this summer. John MacKinnon had a very successful race in Frankfurt, Germany in July. Tim Brooks did his first Ironman at Mt. 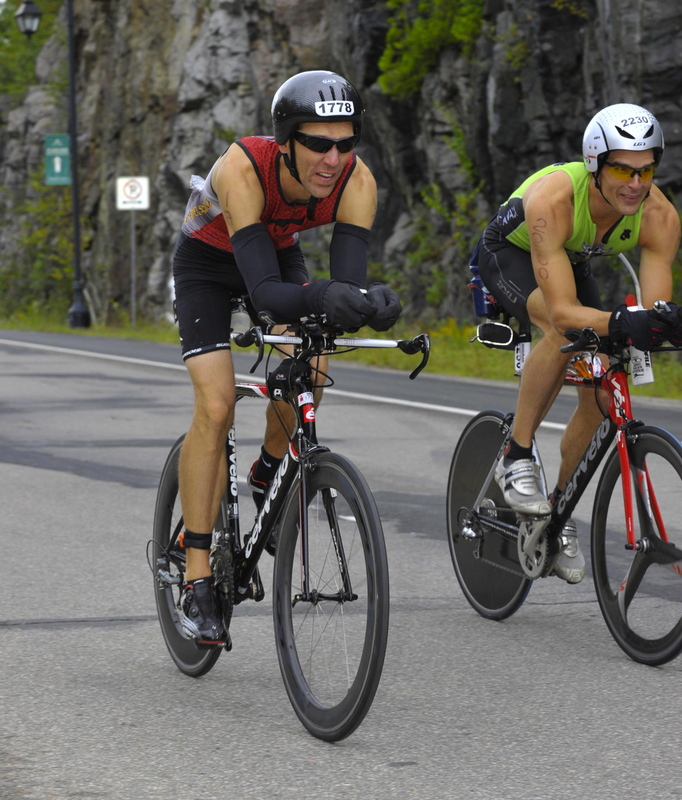 Tremblant along with myself and Glenn Basso in the latter part of August. I’m late posting this report, but it’s a good read about a first Ironman experience. Thanks to Tim for writing it. I caught up to Tim a few K into the bike. We were sharing a laugh as I came abreast of him. Got there Friday, for Sunday’s race. This was plenty of time for us. The weather totally sucked – never above 14 degrees, often raining. line. It was great and we were very thankful for the convenience. I slept 6 hours Saturday night, slept through 3:30 alarm but woke up at 4 am. Ate oatmeal, an egg on toast, and had my first coffee in 3 weeks. hard-boiled egg in my toolbag. group, and by far the biggest with 340 athletes. Thanks to Gail Vassallo for sending this report. Summer is over and I’m just finding time again to sit in front of a computer and post some long-overdue report. Watch the blog, or better yet, sign up for automatic updates (at the right of this page) so you’ll get notified by email with each new post. 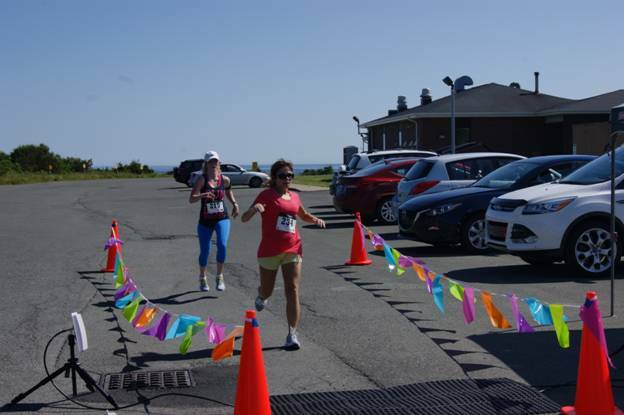 The First Heartthrob 5K was held in Glace Bay on July 12. This event was held as a fundraiser for the Heart & Stoke Foundation Big Bike Ride. 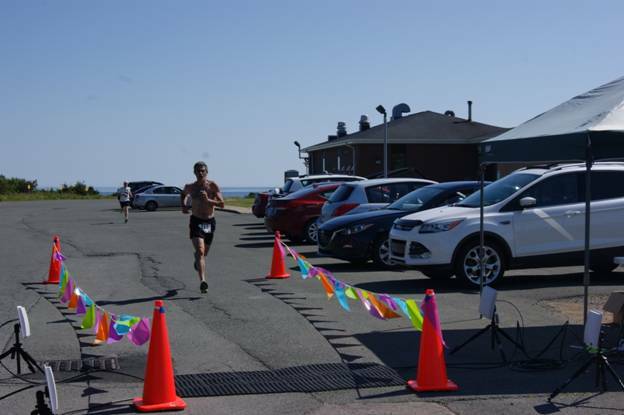 It was the first road race held in Glace Bay in recent years so we’re going to keep it going and hopefully tie the run in with Bay Days next summer. A total of 25 runners came out for this fun run which I think was great for the inaugural run. It was a very hot morning but we had some great finishes despite the heat. Dean Abbass won the men’s race in 18:54 with Steve MacNeil right behind him in 19:00. Robert Aucoin took third in 21:05 and I have to mention that Davy McInnis ran his first ever 5K in 21:51! In the women’s race Aimee Crowe took the win in 25:11 by a hair with Sam Hodder in 25:12, Laura Doucette rounded out the top three in 27:04. Full results can be found at limitlessracetiming.com. A big Thank you to everyone who came out for this run, our Big Bike team ended up raising over $6,000 for Heart & Stroke! OK, so in theory it wasn’t really a hurricane that hit St. Andrews, but instead a “tropical depression” or “tropical storm”, or something of that sort. Bah – semantics. 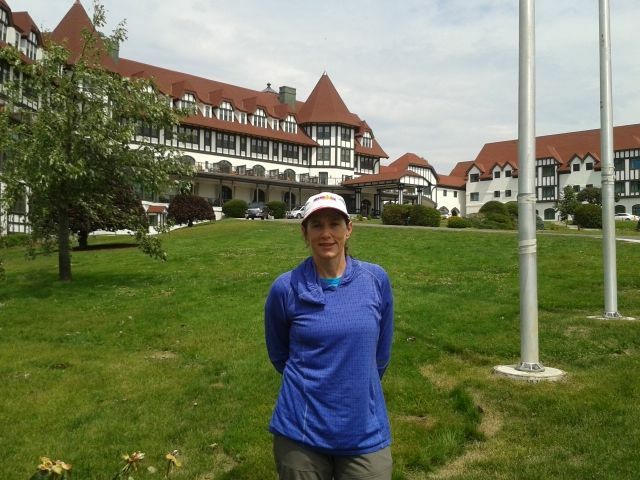 All I know is that when we got there on Saturday afternoon, the power was out in the whole area, the hotel was in darkness, all the barriers and signs that had been put up by the race organizers were lying flat and scattered. 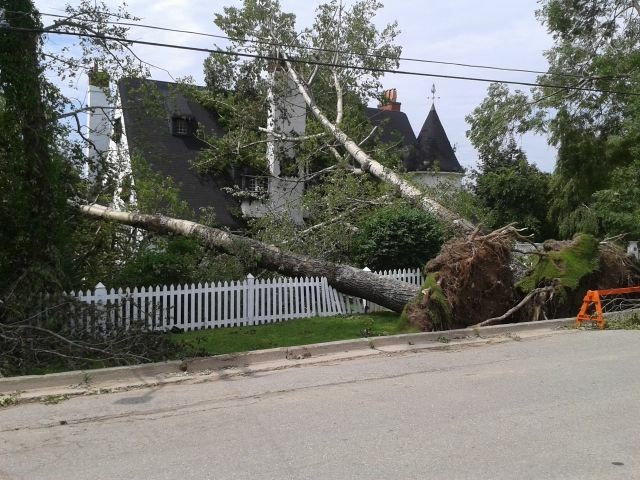 Add to that huge limbs and whole trees down all over town, including over the road and on power lines. At that point, Julie and I figured they would never get things ready for the race, due to start in about 17 hours from when we arrived. But amazingly they pulled it off. I’ll go back again. If they can put on such a great race despite that, they can manage anything! As many of you know, Challenge St. Andrews is actually the second year for the half-ironman there, but the first year coming under the “Challenge” banner. The Challenge series, along with Rev-3, is one of the major competitors to Ironman Corp, which holds almost a monopoly over the long-distance racing world, having copyrighted the “Ironman” name (kind of like being able to copyright the name “marathon” – but that’s another discussion). Challenge has a reputation for putting on great races, and being better to their athletes than the M-dot folks, with lower fees, better cancellation policies, etc. Dan MacDonald was a training partner and competitor of Johnny Miles “back in the day”. 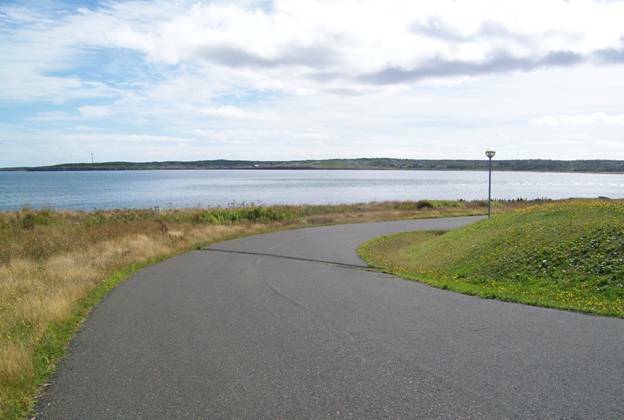 The Canada Day race in Baddeck has been a fixture of our race circuit for many years, and is named in his honour. 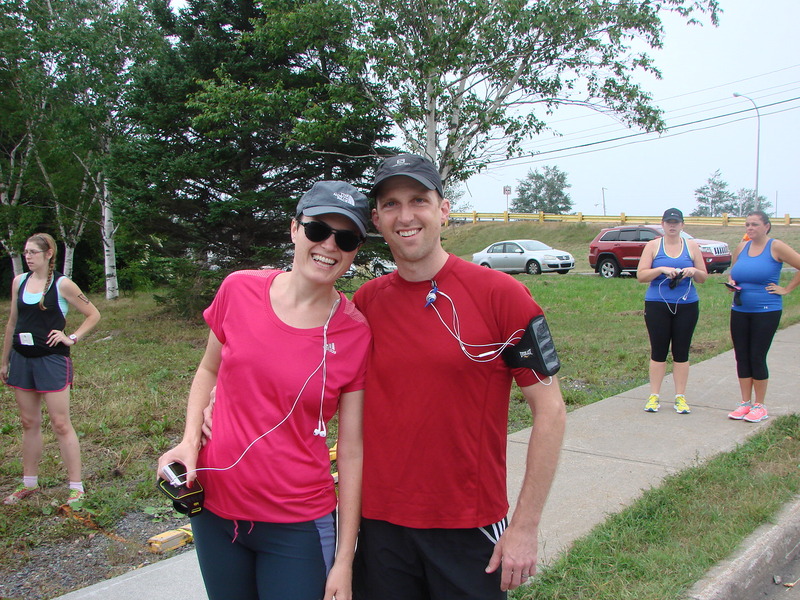 The run starts and finishes on the beautiful Baddeck waterfront at the yacht club. 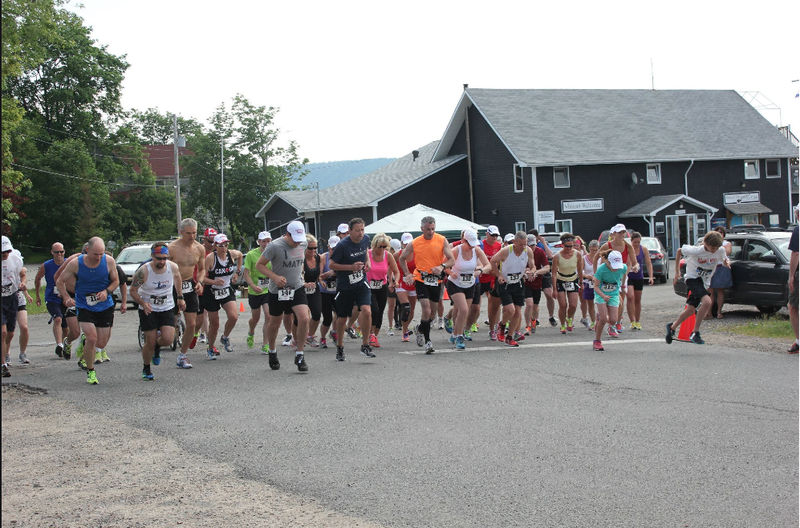 Many runners stay in Baddeck afterwards for the parade and other Canada Day events in Baddeck. With dates falling as they are, the race was again very close to Musselfest (48 hrs after) and just 4 days before Marion Bridge. This no doubt limited numbers somewhat but still there were still over 50 runners between the 10K and the 3K kids/beginners run. Once again BGC Engineering in Baddeck was the generous sponsor that allowed the race to happen. Ed Carey, head of BGC, often runs the race but was coming off a half marathon, so we’ll give him a pass this time.